Sesamin, one of the most abundant lignans in sesame seeds, has been shown to exhibit various pharmacological effects. The aim of this study was to elucidate whether sesamin promotes cell cycle arrest and induces apoptosis in HepG2 cells and further to explore the underlying molecular mechanisms. Here, we found that sesamin inhibited HepG2 cell growth by inducing G2/M phase arrest and apoptosis. Furthermore, sesamin suppressed the constitutive and interleukin (IL)-6-induced signal transducer and activator of transcription 3 (STAT3) signalling pathway in HepG2 cells, leading to regulate the downstream genes, including p53, p21, cyclin proteins and the Bcl-2 protein family. Our studies showed that STAT3 signalling played a key role in sesamin-induced G2/M phase arrest and apoptosis in HepG2 cells. These findings provided a molecular basis for understanding of the effects of sesamin in hepatocellular carcinoma tumour cell proliferation. Therefore, sesamin may thus be a potential chemotherapy drug for liver cancer. Sesamin (Fig. 1) is the most abundant lignan in sesame (Sesamum indicum L.) seed oil and is also found in several other medicinal herbs, including Acanthopanax senticosus Harms. Sesamin has been found to have various pharmaceutical functions, including protection against oxidative stress, anti-inflammation, anti-hypertension, and the reduction of chemical-induced tumours.9–12) Previous studies have demonstrated that the proliferation of a wide variety of tumour cells was suppressed by sesamin treatment, such as myeloma, leukaemia, and cancers of the prostate, colon, pancreas, breast, and lung.13) However, the underlying mechanism behind sesamin-induced inhibition of the proliferation of tumour cells remains to be elucidated. In the present study, we found that sesamin inhibited the IL-6-induced HepG2 cell growth, by inducing cell cycle arrest at the G2/M phase and apoptosis. For the first time, we demonstrated that sesamin exerts its anti-cancer activity through suppressing the gp130-mediated STAT3 signalling pathway required for carcinogenesis by inhibiting transcriptional activities and suppressing downstream genes expression. Sesamin was purchased from Shanghai Tauto Biotech Co., Ltd. (Shanghai, China. The product analysis report is available in Supplementary information.). It was dissolved in dimethylsulfoxide (DMSO) to create a stock solution for subsequent dilution and use. Dulbecco’s modified Eagle’s medium (DMEM), foetal bovine serum (FBS), and phosphate-buffered saline (PBS) were obtained from Gibco (Grand Island, NY, U.S.A.). DMSO, 3-(4,5-dimethyl-thiazol-2-yl)-2, 5-diphenyltetrazolium bromide (MTT), AG490, trypan blue, propidium iodide (PI), fluorescein isothiocyanate (FITC)-conjugated Annexin-V, and Hoechst 33258 were obtained from Sigma (St. Louis, MO, U.S.A.). Trizol Reagent kit and M-MLV reverse transcriptase were obtained from Invitrogen (Carlsbad, CA, U.S.A.). Cell Lysis Buffer for Western blotting and IP, Nuclear and Cytoplasmic Extraction Reagents Kit, and Enhanced BCA Protein Assay Kit were obtained from Beyotime (Nanjing, China). 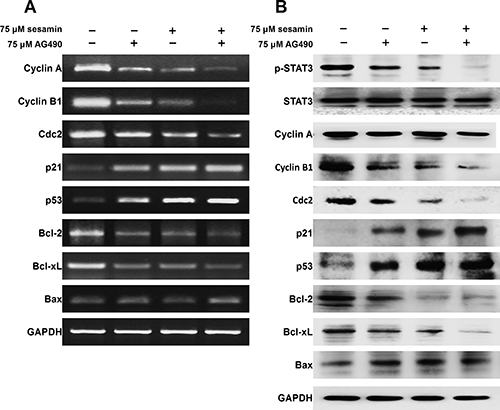 Antibodies against Cyclin A, Cyclin B1, p21, p53, Bcl-2, Bcl-xL, Bax, JAK2, phospho-JAK2 (Tyr 1007/Tyr 1008), STAT3, phospho-STAT3 (Tyr 705), gp130, phospho-gp130 (Ser 782), glyceraldehyde-3-phosphate dehydrogenase (GAPDH), and β-actin were obtained from Santa Cruz (CA, U.S.A.). The secondary horseradish peroxidase (HRP)-linked antibodies were obtained from Boster (Wuhan, China). Enhanced chemiluminescence kit was obtained from Millipore (Billerica, MA, U.S.A.). Human hepatocellular carcinoma cell line (HepG2) and human normal liver cell line (L02) was obtained from the China Center for Type Culture Collection (Wuhan University, Wuhan, China). The cells were cultured in DMEM supplemented with 10% FBS and 1% penicillin/streptomycin in a humidified incubator at 37°C with 5% CO2. Cell growth and viability were determined by the MTT assay. HepG2 and L02 cells were plated in 96-well plates at a density of 1×104 cells per well and cultured overnight. Cells were incubated with sesamin at the following concentrations: 0, 25, 50, 75, 100, or 125 µM for 24 and 48 h. A total of 20 µL of MTT was added to each well and then the plate was incubated for 4 h at 37°C. After removal of the supernatant from each well, the insoluble product was dissolved by addition of 100 µL of DMSO. The product was quantified by measuring the absorbance at 496 nm using a microplate reader (Sunrise, Tecan, Switzerland). Cells incubated with DMSO alone served as a control. Flow cytometry was used to determine the presence of cell cycle arrest. After treatment with sesamin at concentrations of 0, 25, 50, 75, 100 or 125 µM for 48 h, the cells were harvested by trypsinisation and washed twice with PBS, fixed in ice-cold 80% ethanol, and stored overnight at 4°C. For analysis, the cells were washed with PBS twice, suspended in 1 mL of a cold PI solution (50 µg/mL PI and 100 µg/mL RNase A). Next, the cells were incubated on ice for 30 min in the dark and then analysed with a Coulter Epics XL Flow Cytometer (Beckman, Miami, FL, U.S.A.). After treatment with sesamin for 48 h, the extent of apoptosis and necrosis were determined. The cells were harvested and washed twice with cold PBS, suspended in a binding buffer (1×) and then stained with PI and FITC-conjugated annexin V for 15 min in dark. The stained cells were analysed directly by flow cytometry. Apoptosis of HepG2 cells was observed morphologically by nuclear staining with Hoechst 33258 dye. HepG2 cells were placed in the 6-well plates and seeded on sterile coverslips. After 24 h, the cells were treated with 75 µM DMSO or sesamin for 48 h. Next, the cells were washed with PBS and fixed with 4% paraformaldehyde for 10 min, and incubated with 50 µM Hoechst 33258 staining solution for 15 min in the dark, then washed with PBS for three times. The cells were viewed under a fluorescence microscope (Olympus, Tokyo, Japan). HepG2 cells were placed in the 6-well plates and treated with sesamin for 48 h. The total RNA was extracted using a Trizol Reagent kit, then reversely transcribed using M-MLV reverse transcriptase following the instructions. The cDNAs were amplified by PCR, with the primers showed in Table 1. The PCR reaction mixture contained 10 mM Tris–HCl (pH 8.3), 50 mM KCl, 1.5 mM MgCl2, 2.5 U of Taq DNA polymerase, 0.2 mM deoxynucleotide triphosphate (dNTPs), and 0.1 mM of each primer. PCR amplification was performed using the following conditions: 5 min at 94°C followed by 35 repetitive cycles of 30 s at 94°C, 30 s at 55°C, and 30 s at 72°C with a final extension. Cells were harvested and lysed using Cell Lysis Buffer for Western blotting and IP. The nuclear protein was extracted according to the instructions provided with the Nuclear and Cytoplasmic Extraction Reagents Kit. Protein concentration was measured using an Enhanced BCA Protein Assay Kit. The Equal quantities of protein samples were separated by sodium dodecyl sulfate polyacrylamide gel electrophoresis (SDS-PAGE) and transferred by electroblotting to a nitrocellulose membrane. The membrane was blocked with 5% non-fat milk in TBST buffer (20 mM Tris–HCl, pH 7.4, 150 mM NaCl and 0.1% Tween 20) overnight at 4°C. Next, the membrane was incubated with specific primary antibodies for 2 h and a secondary antibody (horseradish peroxidase-conjugated anti-mouse or anti-rabbit immunoglobulin G) for 1 h. The antibodies are listed in Table 2. The signal was visualised with an enhanced chemiluminescence kit and Enhanced Chemiluminescence Plus (ECL Plus) detection system (Bio-Rad, Richmond, CA, U.S.A.). All the experiments were repeated for three independent experiments and the data are expressed as the mean±S.D. Group results were analysed by Nosa5 software. A value of p<0.05 was considered to be statistically significant. We investigated the effects of sesamin on the proliferation of HepG2 cells using the MTT assay. Our results indicated that the proliferation of HepG2 cells was inhibited after 48 h of treatment with sesamin in a concentration-dependent manner. However, no obvious toxic effects were observed at 24 h, except when the concentration of sesamin reached 125 µM. The IC50 value for sesamin was 98 µM. In contrast, sesamin was less cytotoxic to the hepatocyte L02 cells when compared with HepG2 cells (Fig. 2A). Morphological changes of HepG2 cells demonstrated that cell growth was inhibited by sesamin after a 48 h-treatment (Fig. 2B). AG490, a JAK2 specific inhibitor, could inhibit the HepG2 cell growth, whereas was attenuated by IL-6. However, AG490 was less cytotoxic to L02 cells (Fig. 2C). These findings indicated that STAT3 signalling might play an important role in the decreased viability of HepG2 cells but not important in L02 cells. In addition, DMSO alone treated cells did not show any obvious inhibitory effects compared with untreated cells (data not shown). 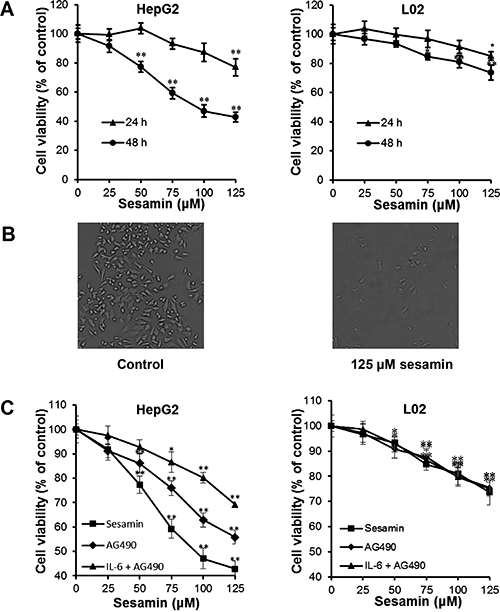 (A) Cell viability assay of HepG2 and L02 cells under treatment of sesamin. HepG2 and L02 cells were treated with various concentrations (0, 25, 50, 75, 100, or 125 µM) of sesamin for 24 h or 48 h. Viable cell numbers were determined using an MTT assay. (B) Morphological changes of HepG2 cells under treatment of sesamin. HepG2 cells were incubated with 125 µM sesamin or DMSO (control) for 48 h, and then the cells were observed under the microscope. (C) Cell viability assay of HepG2 and L02 cells under treatment of AG490 and IL-6. The cells were pretreated with or without IL-6 (50 ng/mL) 2 h before AG490 (75 µM) treatment for an additional 48 h. Viable cell numbers were determined using an MTT assay. The results are expressed as the mean±S.D. of three independent experiments. * p<0.05 and ** p< 0.01 when compared with the control group (DMSO treatment without sesamin). 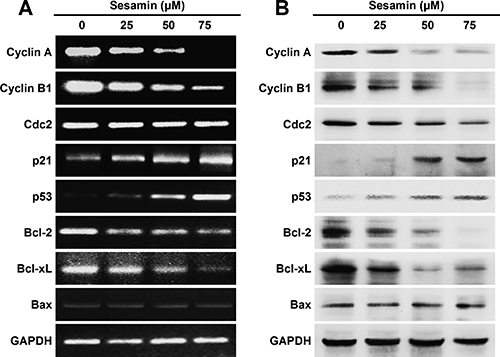 To examine the effects of sesamin on cell cycle distribution, HepG2 cells were incubated for 48 h with sesamin (0, 25, 50, 75, 100, or 125 µM) and examined by flow cytometry (Fig. 3A). Sesamin treatment leaded to a concentration-dependent increase in the G2/M phase cell population (Fig. 3B). These results indicated that sesamin could induce G2/M arrest of the HepG2 cell cycle and cause growth inhibition. (A) PI staining. HepG2 cells were grown for 48 h in the presence of 0, 25, 50, 75, 100, or 125 µM sesamin and then stained by PI. Next, cell cycle distribution was determined by flow cytometry. (B) The percentage of cells in each phase of the cell cycle is presented. To determine whether sesamin-induced HepG2 cell death involves apoptosis, flow cytometry using Annexin V-PI staining was performed. HepG2 cells were treated with different concentrations of sesamin (0, 25, 50, 75, 100, or 125 µM) for 48 h. As shown in Figs. 4A, B, the proportions of Annexin V-positive and PI-negative (Annexin V+/PI−) cells were markedly increased, indicating that sesamin induced early apoptosis of HepG2 cells. The proportion of apoptotic cells in treated cells increased in a dose-dependent manner. The apoptosis of HepG2 cells induced by sesamin was also observed by chromatin condensation and nuclear fragmentation in cells stained with Hoechst 33258 fluorescent dye (Fig. 4C). (A) Annexin V/FITC and PI staining. HepG2 cells were grown for 48 h in the presence of 0, 25, 50, 75, 100, or 125 µM sesamin and then stained by Annexin V/FITC and PI. Next, living and apoptotic cell distribution was analysed by flow cytometry. (B) The percentage of cells in each quadrant. LL, living cells (Annexin V−/PI−); LR, early apoptotic cells (Annexin V+/PI−); UR, late apoptotic cells (Annexin V+/PI+); UL, necrotic cells (Annexin V−/PI+). An increase in early apoptotic cells was showed. (C) Hoechst 33258 staining. Nuclear morphology as determined by Hoechst staining in HepG2 cells incubated for 48 h with DMSO as control, or 75 µM sesamin. Apoptotic cells showed chromatin condensation and nuclei fragmentation (arrows). Previous studies have shown that STAT3 is a key point of multiple oncogenic signalling pathways. In the present study, we investigated whether sesamin could modulate the constitutive STAT3 signalling pathway in HepG2 cells. As shown in Fig. 5A, Western blotting analysis with specific antibodies against JAK2, p-JAK2, STAT3, and p-STAT3 revealed that 48 h-sesamin treatment resulted in a strong concentration-dependent decrease in the phosphorylation level of JAK2 and STAT3 in HepG2 cells. However, sesamin had no effect on the total protein level of JAK2 and STAT3. Moreover, sesamin treatment significantly reduced STAT3 level in the nuclear in a dose-dependent manner as well as the phosphorylation level of nuclear STAT3 (Fig. 5B). These results suggested that sesamin inhibited the STAT3 signalling pathway and STAT3 nuclear translocation in HepG2 cells. (A) After the cellular proteins were lysed, p-STAT3, STAT3, p-JAK2, and JAK2 were examined by Western blotting. GAPDH was used as an internal control. (B) Nuclear proteins were extracted, and the amount of both p-STAT3 and STAT3 were examined. β-Actin was used as an internal control for the nuclear fraction. The STAT3 signalling pathway participates in cell cycle and apoptosis by directly or indirectly regulating many genes, including cyclin A, cyclin B1, Cdc2, p53, p21, and the Bcl-2 protein family. The expression of these genes were investigated at transcriptional and translational levels by RT-PCR and Western blotting in HepG2 cells treated with 0, 25, 50, or 75 µM sesamin (Fig. 6). Cyclin A, cyclin B1, and Cdc2 are necessary for the G2/M checkpoint in the cell cycle. We found that the mRNA and protein levels of cyclin A and cyclin B1 were down-regulated by sesamin treatment in a concentration-dependent manner. Although Cdc2 was also markedly down-regulated by sesamin treatment at the protein level, the expression of Cdc2 was not affected by sesamin treatment at the mRNA level. Furthermore, sesamin caused a concentration-dependent increase in p53 and p21 levels, suggesting that p53/p21 signalling participated in sesamin-triggered G2/M arrest. Apoptosis is tightly orchestrated through the interactions of the Bcl-2 protein family, including pro-apoptotic proteins, such as Bax, and anti-apoptotic proteins, such as Bcl-2 and Bcl-xL. Our results showed that sesamin down-regulated Bcl-2 and Bcl-xL, but it had no obvious effect on Bax expression. To determine whether this phenomenon could be explained by the STAT3 inhibition, we treated HepG2 cells with 75 µM sesamin or 75 µM AG490, a specific JAK2 inhibitor. As shown in Fig. 7, AG490 regulated the expression of these genes as well as sesamin. Furthermore, there was a synergistic effect on these genes when the cells were treated with sesamin and AG40 in combination. These results demonstrated that sesamin could regulate the expression of genes involved in cell cycle and apoptosis in HepG2 cells, which was caused by the STAT3 inhibition. HepG2 cells were incubated for 48 h with 0, 25, 50, or 75 µM sesamin. (A) The effects of sesamin on gene expression at the mRNA level were analysed by RT-PCR. GAPDH was used as an internal control. (B) The effects of sesamin on gene expression at the protein level were analysed by Western blotting. GAPDH was used as an internal control. HepG2 cells were incubated for 48 h with or without 75 µM sesamin or 75 µM AG490. (A) The expression of STAT3 signalling downstream genes at the mRNA level were analysed by RT-PCR. GAPDH was used as an internal control. (B) STAT3, p-STAT3 and STAT3 signalling downstream genes were examined by Western blotting. GAPDH was used as an internal control. IL-6 is an important cytokine in the inflammatory microenvironment surrounding the tumour, which can induce cell growth and gp130/STAT3 signalling. To further study whether sesamin induces reduction of gp130, which is mediated to the STAT3 signalling pathway, we investigated the sesamin effects on IL-6-induced HepG2 cells. HepG2 cells were pretreated without or with IL-6 (50 ng/mL) for 2 h, and then incubated for 48 h in the presence or absence of sesamin. MTT assay demonstrated that IL-6 attenuated the reduced viability caused by sesamin (Fig. 8A). Next, levels of gp130, p-gp130, STAT3 and p-STAT3 were assessed. We found that IL-6 up-regulated the level of p-gp130 and p-STAT3 as well as nuclear STAT3. However, sesamin attenuated the IL-6-induced changes in p-gp130 and p-STAT3 in a dose-dependent manner (Fig. 8B). Furthermore, we examined whether sesamin modulated the expression of genes which were directly regulated by STAT3 following IL-6 treatment in HepG2 cells (Fig. 8C). We found that IL-6 antagonised sesamin-induced changes in HepG2 cells pretreated with IL-6. (A) Cell viability assay of HepG2 cells under treatment of sesamin and IL-6. HepG2 cells were pretreated with or without IL-6 (50 ng/mL) 2 h before sesamin treatment for an additional 48 h. Viable cell numbers were determined using an MTT assay. The results are expressed as the mean±S.D. of three independent experiments. * p<0.05 and **p<0.01 when compared with the control group (DMSO treatment without sesamin). 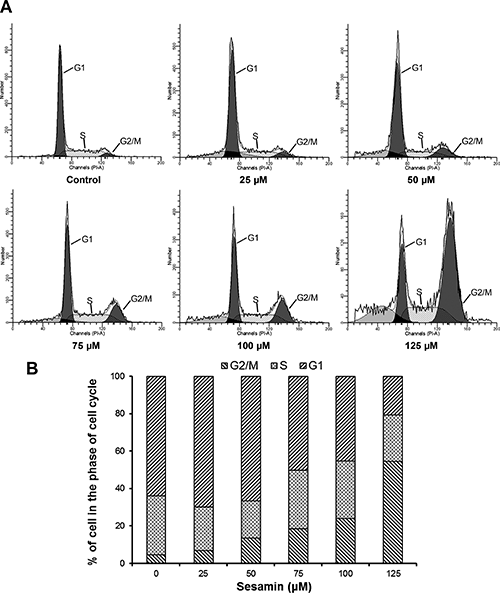 (B) HepG2 cells were pretreated with or without IL-6 (50 ng/mL) for 2 h, and then incubated for 48 h with 0, 25, 50, or 75 µM sesamin. The level of p-gp130, gp130, p-STAT3, and STAT3 in the whole protein extracts and nuclear proteins extracts were analysed by Western blotting. GAPDH and β-actin were used as an internal control, respectively. (C) HepG2 cells were pretreated with or without IL-6 (50 ng/mL) for 2 h, and then incubated for 48 h with or without 75 µM sesamin. The effects of sesamin on gene expression at the mRNA level and protein level were analysed by RT-PCR and Western blotting, respectively. GAPDH was used as an internal control. 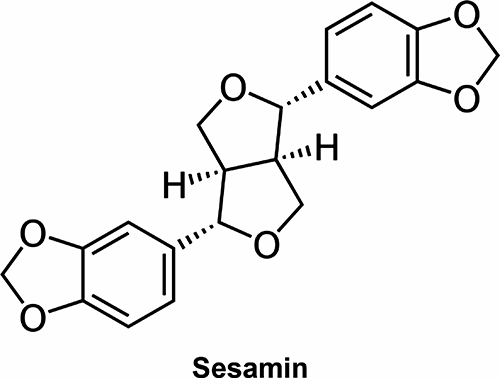 Sesamin (Fig. 1) has been shown to have anti-cancer effects.13) In the present study, the effects of sesamin on a human hepatoma cell line (HepG2) were investigated. Our results showed that sesamin inhibited the viability of HepG2 cells but exerted less cytotoxicity in normal human hepatocyte (L02) cells (Fig. 2). Subsequent flow cytometric analysis showed that the growth inhibition observed in response to sesamin was due to G2/M cell cycle arrest and apoptosis (Figs. 3, 4). IL-6 is an important cytokine that maintains the inflammatory microenvironment surrounding a tumour, which is a STAT3 signalling activator. Our results showed that the growth of sesamin treated HepG2 cells was recovered by IL-6 (Fig. 8A). Moreover, the JAK2 specific inhibitor AG490 could inhibit the HepG2 cell growth, whereas was attenuated by IL-614) (Fig. 2C). These results indicated that sesamin inhibited tumour growth caused by constitutively activated and IL-6 induced STAT3 signalling. A large body of evidence has shown that STAT3 is one of the few key regulatory signalling molecules whose aberrant activation is invariably associated with inflammation and cancer.2) Interestingly, sesamin stronger inhibited HepG2 cell growth than AG490 at the same concentration, suggesting that there might be other mechanisms (Fig. 2C). Harikumar et al. found that sesamin could suppress the nuclear factor (NF)-kappa B signalling in tumour cells, which confirmed our view.13) Both sesamin and AG490 were less cytotoxic to L02 cells, suggesting that STAT3 signalling might be not abnormal activated in normal cells (Fig. 2C). Sesamin might be useful and safe for targeted therapy, especially in malignancies which have aberrant IL-6 expression. Cell growth is controlled by cell cycle and apoptosis. Many anti-cancer drugs play a therapeutic role through inducing cell cycle arrest and apoptotic.15) STAT3 plays a key role in cell cycle and apoptosis. Constitutively activated STAT3 signalling is widely found in cancer cells and results in tumour development by regulation of genes encoding apoptosis regulators, such as Bcl-2 and Bcl-xL, and cell cycle regulators, such as cyclin proteins.16,17) Here we found that sesamin inhibited IL-6-induced gp130 phosphorylation leading to block the JAK2 and STAT3 phosphorylation, and then suppressed STAT3 nuclear translocation in HepG2 cells (Figs. 5, 8). The suppression of STAT3 signalling by sesamin resulted in the regulation of its target genes, including p53, p21, cyclin A, cyclin B1, Cdc2, Bcl-xL, and Bcl-2, which was enhanced by co-treated with sesamin and AG490 (Fig. 7). However, the expression of these genes in sesamin treated HepG2 cells were recovered by the IL-6 treatment (Fig. 8C). Based on these observations, we might suggest that sesamin-induced G2/M arrest and apoptosis of HepG2 cells were carried out through the STAT3 signalling pathway. A number of Cdk and cyclin proteins have been shown to control cell cycle events. The Cdc2-cyclin A complex and Cdc2-cyclin B1 complex are required for the G2/M phase.18) Our data suggested that the down-regulation of cyclin A and cyclin B1 by sesamin caused G2/M phase arrest in HepG2 cells. Cdc2 levels were markedly down-regulated by sesamin treatment at the protein level; however, the expression of Cdc2 was not affected by sesamin treatment at the mRNA level, suggesting that sesamin might induce Cdc2 protein degradation to suppress the Cdc2 complex (Fig. 6). The results of our present study indicated that sesamin enhanced the expression of the p53 and p21 Cdk inhibitor at both transcriptional and translational levels through suppressing the activation of STAT3. There are multiple STAT-binding sites in the p53 promoter and STAT3 interacts with them.19) Previous studies have shown that STAT3 was used to down-regulate p53 gene expression in tumours.3) As a target gene of STAT3, the tumour suppressor p53 is an crucial point in every cell cycle checkpoints.20) Several p53 target genes have been found to play a role in p53-induced G2/M arrest, such as Cdc25C, GADD45, and p21.21–23) Activated p53 binds to DNA and activates expression of the cyclin-dependent kinase inhibitor p21 which plays an primary role in the DNA damage response by inducing cell cycle arrest and direct inhibition of DNA replication; in addition, p21 regulates fundamental processes, including apoptosis and transcription.23) p21 was also implicated in G2/M arrest by inhibiting cyclin A-Cdc2 complex and cyclin B1-Cdc2 complex activity through blocking of the interaction between Cdc25C and the complexes.20) We found that the activation of STAT3 was suppressed by sesamin, leading to up-regulated of downstream p53/p21, and then induced G2/M arrest in HepG2 cells. These results were demonstrate by treating cells with sesamin and AG490 or IL-6 in combination (Figs. 6–8). Previous research has shown that cell cycle arrest at G1/S phase occurs via STAT3 inhibition,24–27) however, our current study suggested that STAT3 also played an important role in drug-induced G2/M phase arrest, which was demonstrated by Weissenberger et al.,28) Chetty et al.,29) and Huang et al.30) Interestingly, Yokota et al. found that sesamin induced growth arrest at the G1 phase of the cell cycle in a human breast cancer cell line MCF-7.31) These data implied that the anti-cancer mechanisms of sesamin might vary depending on the cancer type. In conclusion, we have provided evidence that sesamin has the ability to suppress the STAT3 signalling pathway in HepG2 cells, leading to the decrease of cell proliferation through G2/M phase arrest and inducing apoptotic. 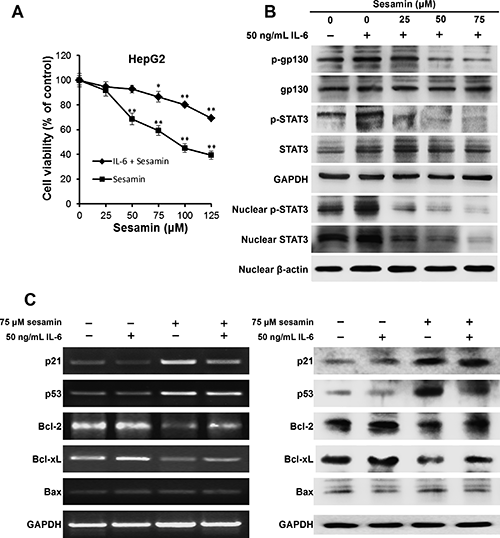 The results in this study also provide evidence for sesamin as a potential STAT3 inhibitor and therapeutic compound for the treatment of hepatocellular carcinoma. This work was supported by the Wuhan Science and Technology Project (201260523185), the International Scientific and Technological Cooperation project of the Ministry of Science and Technology of China (2009DFB20290), and National Genetically Modified New Varieties of Major Projects of China (2013ZX08002-004, 2013ZX08010-004). 1) Lin YW, Chiang BH. 4-Acetylantroquinonol B isolated from Antrodia cinnamomea Arrests proliferation of human hepatocellular carcinoma HepG2 cell by affecting p53, p21 and p27 levels. J. Agric. Food Chem., 59, 8625–8631 (2011). 2) Bollrath J, Phesse TJ, Von Burstin VA, Putoczki T, Bennecke M, Bateman T, Nebelsiek T, Lundgren-May T, Canli O, Schwitalla S, Matthews V, Schmid RM, Kirchner T, Arkan MC, Ernst M, Greten FR. gp130-mediated STAT3 activation in enterocytes regulates cell survival and cell-cycle progression during colitis-associated tumorigenesis. Cancer Cell, 15, 91–102 (2009). 3) Yu H, Jove R. The STATs of cancer - New molecular targets come of age. Nat. Rev. Cancer, 4, 97–105 (2004). 4) Darnell JE Jr. STATs and gene regulation. Science, 277, 1630–1635 (1997). 5) Reich NC, Liu L. Tracking STAT nuclear traffic. Nat. Rev. Immunol., 6, 602–612 (2006). 6) Bowman T, Garcia R, Turkson J, Jove R. STATs in oncogenesis. Oncogene, 19, 2474–2488 (2000). 7) Michaud-Levesque J, Bousquet-Gagnon N, Beliveau R. Quercetin abrogates IL-6/STAT3 signaling and inhibits glioblastoma cell line growth and migration. Exp. Cell Res., 318, 925–935 (2012). 8) Taga T, Kishimoto T. gp130 and the interleukin-6 family of cytokines. Annu. Rev. Immunol., 15, 797–819 (1997). 9) Chung B-H, Lee JJ, Kim J-D, Jeoung D, Lee H, Choe J, Ha K-S, Kwon Y-G, Kim Y-M. Angiogenic activity of sesamin through the activation of multiple signal pathways. Biochem. Biophys. Res. Commun., 391, 254–260 (2010). 10) Hou RCW, Wu CC, Yang CH, Jeng KCG. 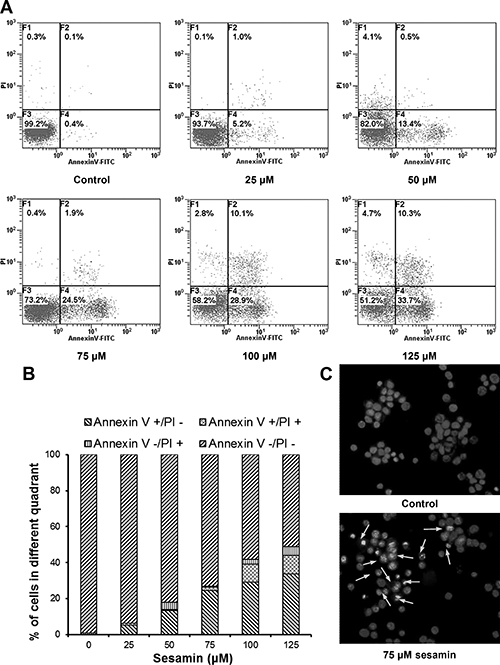 Protective effects of sesamin and sesarnolin on murine BV-2 microglia cell line under hypoxia. Neurosci. Lett., 367, 10–13 (2004). 11) Fujikawa T, Kanada N, Shimada A, Ogata M, Suzuki I, Hayashi I, Nakashima K. Effect of sesamin in Acanthopanax senticosus Harms on behavioral dysfunction in rotenone-induced Parkinsonian rats. Biol. Pharm. Bull., 28, 169–172 (2005). 12) Nakano D, Itoh C, Ishii F, Kawanishi H, Takaoka M, Kiso Y, Tsuruoka N, Tanaka T, Matsumura Y. Effects of sesamin on aortic oxidative stress and endothelial dysfunction in deoxycorticosterone acetate-salt hypertensive rats. Biol. Pharm. Bull., 26, 1701–1705 (2003). 13) Harikumar KB, Sung BY, Tharakan ST, Pandey MK, Joy B, Guha S, Krishnan S, Aggarwal BB. Sesamin manifests chemopreventive effects through the suppression of NF-kappa B-regulated cell survival, proliferation, invasion, and angiogenic gene products. Mol. Cancer Res., 8, 751–761 (2010). 14) Kusaba M, Nakao K, Goto T, Nishimura D, Kawashimo H, Shibata H, Motoyoshi Y, Taura N, Ichikawa T, Hamasaki K, Eguchi K. Abrogation of constitutive STAT3 activity sensitizes human hepatoma cells to TRAIL-mediated apoptosis. J. Hepatol., 47, 546–555 (2007). 15) Kaina B. DNA damage-triggered apoptosis: critical role of DNA repair, double-strand breaks, cell proliferation and signaling. Biochem. Pharmacol., 66, 1547–1554 (2003). 16) Chan KT, Li K, Liu SL, Chu KH, Toh M, Xie WD. Cucurbitacin B inhibits STAT3 and the Raf/MEK/ERK pathway in leukemia cell line K562. Cancer Lett., 289, 46–52 (2010). 17) Jing N, Tweardy DJ. Targeting STAT3 in cancer therapy. Anticancer Drugs, 16, 601–607 (2005). 18) Williams GH, Stoeber K. The cell cycle and cancer. J. Pathol., 226, 352–364 (2012). 19) Niu G, Wright KL, Ma Y, Wright GM, Huang M, Irby R, Briggs J, Karras J, Cress WD, Pardoll D, Jove R, Chen J, Yu H. Role of STAT3 in regulating p53 expression and function. Mol. Cell. Biol., 25, 7432–7440 (2005). 20) Giono LE, Manfredi JJ. The p53 tumor suppressor participates in multiple cell cycle checkpoints. J. Cell. Physiol., 209, 13–20 (2006). 21) St Clair S, Giono L, Varmeh-Ziaie S, Resnick-Silverman L, Liu WJ, Padi A, Dastidar J, Dacosta A, Mattia M, Manfredi JJ. DNA damage-induced downregulation of Cdc25C is mediated by p53 via two independent mechanisms: One involves direct binding to the cdc25C promoter. Mol. Cell, 16, 725–736 (2004). 22) Zhan Q, Antinore MJ, Wang XW, Carrier F, Smith ML, Harris CC, Forance AJ Jr. Association with Cdc2 and inhibition of Cdc2/cyclin B1 kinase activity by the p53-regulated protein Gadd45. Oncogene, 18, 2892–2900 (1999). 23) Cazzalini O, Scovassi AI, Savio M, Stivala LA, Prosperi E. Multiple roles of the cell cycle inhibitor p21(CDKN1A) in the DNA damage response. Mutat. Res., 704, 12–20 (2010). 24) Hwang H, Kim C, Kim SM, Kim WS, Choi SH, Chang IM, Ahn KS. The hydrolyzed products of iridoid glycoside with β-glucosidase treatment exert anti-proliferative effects through suppression of STAT3 activation and STAT3-regulated gene products in several human cancer cells. Pharm. Biol., 50, 8–17 (2012). 25) Xiong H, Du W, Zhang YJ, Hong J, Su WY, Tang JT, Wang YC, Lu R, Fang JY. Trichostatin A, a histone deacetylase inhibitor, suppresses JAK2/STAT3 signaling via inducing the promoter-associated histone acetylation of SOCS1 and SOCS3 in human colorectal cancer cells. Mol. Carcinog., 51, 174–184 (2012). 26) Kannaiyan R, Hay HS, Rajendran P, Li F, Shanmugam MK, Vali S, Abbasi T, Kapoor S, Sharma A, Kumar AP, Chng WJ, Sethi G. Celastrol inhibits proliferation and induces chemosensitization through down-regulation of NF-kappa B and STAT3 regulated gene products in multiple myeloma cells. Br. J. Pharmacol., 164, 1506–1521 (2011). 27) Nakaya A, Sagawa M, Muto A, Uchida H, Ikeda Y, Kizaki M. The gold compound auranofin induces apoptosis of human multiple myeloma cells through both down-regulation of STAT3 and inhibition of NF-kappa B activity. Leuk. Res., 35, 243–249 (2011). 28) Weissenberger J, Priester M, Bernreuther C, Rakel S, Glatzel M, Seifert V, Kogel D. Dietary curcumin attenuates glioma growth in a syngeneic mouse model by inhibition of the JAK1,2/STAT3 signaling pathway. Clin. Cancer Res., 16, 5781–5795 (2010). 29) Chetty C, Dontula R, Ganji PN, Gujrati M, Lakka SS. SPARC expression induces cell cycle arrest via STAT3 signaling pathway in medulloblastoma cells. Biochem. Biophys. Res. Commun., 417, 874–879 (2012). 30) Huang WW, Yang JS, Lin MW, Chen PY, Chiou SM, Chueh FS, Lan YH, Pai SJ, Tsuzuki M, Ho WJ, Chung JG. Cucurbitacin E induces G(2)/M phase arrest through STAT3/p53/p21 signaling and provokes apoptosis via fas/cd95 and mitochondria-dependent pathways in human bladder cancer T24 cells. Evid. Based Complement. Alternat. Med., 2012, 952762 (2012) 10.1155/2012/952762. 31) Yokota T, Matsuzaki Y, Koyama M, Hitomi T, Kawanaka M, Enoki-Konishi M, Okuyama Y, Takayasu J, Nishino H, Nishikawa A, Osawa T, Sakai T. Sesamin, a lignan of sesame, down-regulates cyclin D1 protein expression in human tumor cells. Cancer Sci., 98, 1447–1453 (2007). 32) Zamzami N, Brenner C, Marzo I, Susin SA, Kroemer G. Subcellular and submitochondrial mode of action of Bcl-2-like oncoproteins. Oncogene, 16, 2265–2282 (1998). 33) Bhattacharya S, Ray RM, Johnson LR. STAT3-mediated transcription of Bcl-2, Mcl-1 and c-lAP2 prevents apoptosis in polyamine-depleted cells. Biochem. J., 392, 335–344 (2005). 34) Nielsen M, Kaestel CG, Eriksen KW, Woetmann A, Stokkedal T, Kaltoft K, Geisler C, Ropke C, Odum N. Inhibition of constitutively activated STAT3 correlates with altered Bcl-2/Bax expression and induction of apoptosis in mycosis fungoides tumor cells. Leukemia, 13, 735–738 (1999). 35) Liang ZW, Guo BF, Li Y, Li XJ, Li X, Zhao LJ, Gao LF, Yu H, Zhao XJ, Zhang L, Yang BX. Plasmid-based STAT3 siRNA delivered by hydroxyapatite nanoparticles suppresses mouse prostate tumour growth in vivo. Asian J. Androl., 13, 481–486 (2011).